One of the many great innovations by 888 is its mobile app for Android. It’s effortless to use and has a platform that’s simple enough to navigate through. Want to bet on your favourite baseball team or join horse racing? This app has it all for you. With its wide range of different sports available, from rugby, golf, tennis, football, to greyhound racing, you’ll surely be on the edge of your seat while scrolling through the app and enjoying its amazing features. The 888sport mobile app also offers over 100 events daily and gives you a chance to make live bets and early cash-ins. After downloading the app and creating an account, you can now bet and play anytime, and at any place you like! The app also rewards you when you place the first bet with triple amount of odds. Another good news – expect more daily bonuses from 888 and available free bets in the future while playing the app! 888 is known to be one of the best sports betting sites around, and this app absolutely mirrors that. The 888sport mobile app for Android contains a lot of great and unique features. It’s very well-made and structured, having an interface that’s simple, yet very useful. And as mentioned before, it offers a wide variety of different gambling options. The app offers a long list of different types of betting. You can find yourself betting live or signing up for stats betting, in-play betting, pre-match betting, handicap betting, and even Asian lines. Its free live streaming has an extra feature of a stats corner that will update you on the game in real-time. It also offers a lot of banking methods for you to choose from for cashing out your winnings. It’s good to note that 888 is also found on the London Stock Exchange, which makes them the only public gambling company. You would be sure that the app and 888 as a whole are safe and could be highly trusted. Your security, fun, and satisfaction from the 888sports mobile app are surely guaranteed. 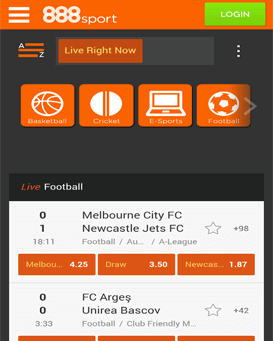 You can easily download the app from betting sites or directly from its website: www.888.com. What is great about registering directly from 888’s website is being rewarded with a sign-up bonus. First is to allow the installation of the app. Make sure to check unknown sources on your mobile. To be able to do so, go to settings, click security and then choose to allow for unknown sources. Load up 888’s website on your phone’s browser, www.888.com. It is important to register with 888sport first before downloading the app. Slide the top menu down and click on the 888 APK file. Select the ‘Package Installer’ button and click ‘install’. Your 888sport app download will now begin and will be seen on your device’s home screen once it is done. This amazing mobile sports app is not only limited to android users but is found on all iOS devices as well. If you’re looking for a great and reliable sports betting provider, look no further because this app has it all. Similar to the Android application, the mobile app from 888 that is being offered to iOS devices is sleek and simple and contains features very similar to the website. It’s equipped with the same wide variety of features as the Android app and is equally handy, reliable and easy to use. There is no doubt that this mobile sports app is undoubtedly competitive compared to all the other available betting apps and sites on the market, and why not? The app offers everything a betting aficionado or sports fanatic would need and even more. At present, the site’s interface has been improved and is now twice better than the one from 2015. The designers of the app have made use of brighter colours, which makes everything pop out better and easier to read. Daily bonuses, offers, and promotions are also always seen right in front of the user or customer so that you would never miss out such amazing offers and be able to enjoy the app at its optimal level. The great thing about the mobile sports app being offered in the iOS is that it doesn’t have to connect through a mobile web browser. You can easily find and download the 888sport iPhone app and 888sport iPad on the Apple app store, meanwhile, all the other devices, including android have to visit the site to be able to download the app. 888iPad users also have the privilege of having a wider screen, thus having a better view of the site using the device’s landscape orientation. iPad users also have a fuller and more precise picture of the sidebar every single time they use the app. It is obvious that the 888sport mobile app features for iOS are numerous and it successfully caters to every customer’s needs when it comes to online sports betting. Similar to what you would find in its Android counterpart, the app is pretty much ideal and convenient on-the-go sports mobile application. The significant number of sports options available is one of the main highlights of the app. It’s impossible not to find your favourite sport on the list from ice hockey, tennis, golf, snooker, cricket and much more. The app also offers an iCard feature for you to be able to bet on horse races easily while watching it live on your device. The only thing you need now is popcorn and a comfy seat, and you’re set for several hours of fun and excitement. Go to the Apple store and type in the name of the app on the search bar or iPhone users can directly download the app by clicking on this link. Register a new account by clicking on the ‘create account’ button. Fill in your personal details and accept the terms and conditions. Fill again necessary details such as phone number and address. Once you are done, you can now go and enjoy betting on sports online! The mobile site version isn’t any different from the Android and iOS versions. It’s as fast and as easy as the other two. The hard work and dedication that 888 has invested on the mobile site are strongly evident. Starting from its design, it is simple, clean, laid-out well and easy to go around. Placing a bet also proves to be hassle-free and very safe. It also offers a similar variety of banking options which makes it easy for anyone to deposit and withdraw their winnings, regardless of where they are situated. The multiple languages to choose from also helps the people using the mobile site make their time on the app more convenient and comfortable to use. Adding a bet using the mobile site is also relatively easy. All you have to do is tap on the prices shown on your selection and what you chose will be shown on your slip. If you want to place multiple bets, then you can just tap on your chosen single markets. After selecting your market, just type in on the empty white field your stake. The features found in the apps and mobile versions are quite similar. They both have access to multiple markets for betting and different events to participate in. They both contain promotional offers and bonuses from 888, to aid punters to increase their chances of winning and overall earn more as they use the app or mobile site. Free bets are available on mobile only. You also have access to live betting and live streaming. Although you need a fast internet connection to enjoy this feature entirely, 888 has designed the app to give you smooth coverage of real-time events. Another highlight of the 888sports mobile app is its bonuses and betting promotions. Upon signing up, you have a 888Sport Welcome Bonus from the company (€10 get €30 bet). Other than that, 888sports app also offers its customers daily bonuses, free bets, occasional bets which could enhance your odds and risk-free bets. The bonus that you get from signing up is another important feature of the app. If you sign up directly on 888’s website, you can avail of your welcome bonus wherein you can claim £30 in free bets when you place the first bet with an amount of £10. This only applies to people that have just signed up on the site. The bonus expires after 7 days once it has been credited. The 888sport mobile app is another new amazing product which has already gained popularity in the domain of online betting. It is easily accessible via download (Android), the app store (for iOS) or by browsing the website from your cell phone or tablet. By a few clicks on your mobile only, you are set and ready to go. However, your mobile must meet specific requirements and must be compatible so it can utilise the app successfully. Examples are Google Nexus, Samsung Galaxy S5, Samsung Galaxy Note 3, and more. The app requires iOS 8.O or its later versions. The app is also available for Nokia and Blackberry mobile devices. As said earlier, one of the great features of 888sports mobile app is that it offers a wide selection of payment methods. Winnings that are larger than £/€/$/30,000 may be cashed out in payments of £/€/$/30,000 amount per month. 888 also has the right to limit the net payout, but it depends on the type of sport or offer, but the limited amount is usually up to £250,000. As one of the forerunners and well-known betting sites around since 2008, 888sport proudly brings the most convenient solution to anyone who prefers using their mobile phones when betting online. It is created to be the sports betting arm of the 888 Holdings PLC. It is an online betting company based in Gibraltar and mainly caters to the European market. In fact, it is a member of the European Sports Betting Integrity Body, ESSA. For years, 888sport (check our main review) has received media coverage and is applauded for its clever use of social media especially during the fight between Carl Froch and George Groves in 2014. In 2011, Santiago Cañizares of the Spanish national football team became the ambassador of 888sport. In 2012, the professional footballer Ian Wright and the horse racing expert Emma Spencer joined Cañizares. Until now, the betting site remains one of the most trusted brands among sports bettors. It has maintained its reputation to be one of the leading betting sites with its amazing offers and promotions. It is considered to be one of the most innovative and dynamic betting companies in the digital world. It is user-friendly and offers cross-platform. How do I create an 888sport account from my device? Before signing up, you have to make sure that you are of legal age which is 18 and above; otherwise, your registration will be invalid. To be able to create your account, go to the site’s homepage, click ‘join now’ and fill in your information. What if I don’t have a Passport or Driver’s License? You can submit a National Identity Card, Armed Forces Card or Birth Certificate for verification. How long does the mobile deposit process take? For most payment methods, it will take about an estimate of 10 minutes. Instant Banking powered by Citadel may take about 15 minutes while deposit through ToditoCash will be processed right away. There are also cases wherein it may take 24 hours for the process, but these cases are rare. What is the ‘Cashier’ tab for? The Cashier is where monetary transactions will take place, such as deposit, withdrawal, and viewing of your history of transactions. What if I decide to close my account? In some cases wherein you would wish to close your account with the website, you can request closure of your account through this link. You can also file for breaks by asking for a one day up to a one month “take a break” period. What do I do during mobile Live betting? You will find on the left-hand side of the menu a notice that says ‘live right now’ or ‘live betting’. Once you see it, click on it to view the markets that are going live at the moment. The number that you would see next to the link tells you the number of markets available. Please, have in mind that a live bet can only be placed after the event has started. What’s the best mobile device to use for the app? There is no definitive answer about which device is better. The only important thing is to make sure that your device meets the system requirements and that you are connected to a fast internet connection to enjoy live betting or streaming. What if the link doesn’t work and I can’t find the .APK file for Android? Open your browser and open the 888sport website. Once the site loads, press on the menu button and select ‘bookmarks’, then press ‘add bookmark’. Press ‘home’ and return to your phone’s main screen. Hold down your finger on an empty space and once a menu opens up, click ‘bookmark’. Choose the bookmarked website. Make sure you have already made your account on the main website before doing all of these steps. Overall, the app has a lot of potential with its variety of features that successfully caters to its target market. The app rates 9 out of 10, due to its attention to detail and thoughtfulness when it comes to developing the app’s features, its various betting markets, sleek design and finally, its secured, not to mention, diverse banking options.